For most people 311 is just a number. Before 310 and after 312. But for some others, 311 is a spirit of life and brotherhood. 311 is a band of brothers who makes music with a mix of rock, rap, funk, and reggae. Became popular among rock connoisseurs in the mid-’90s era at the time universe was dominated by hip-metal and post-grunge. 311 is all mixed up. Is how to come original. Is amber. 311 is a beautiful disaster. In year 2010, 311 has been in its 22 years of togetherness. If the Indonesians consider March 11 as the Supersemar day that brought New Order in Indonesia, 311 people own the same date as the 311th Day; a day dedicated by 311 to its fans. I do love rock music. However, I can not point out a single band that I really-really idolize. But, in one night; I had a dream. A dream in which 311, Nick Hexum, SA, Tim Mahoney, Chad Sexton, and Pnut play at my high school basketball court. They jam in the basketball field, with no stage, surrounded by some people doing lay-out to the ring. The band left a footmark impression in my subconscious. 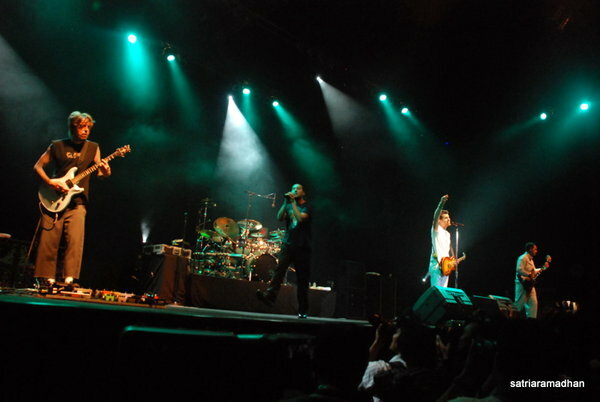 In the final half of 2009, Adrie Subono on Twitter revealed that an agent offered him 311 and Jane’s Addiction for a gig in Indonesia. At that time, @AdrieSubono has been very active in communicating with the music loving public in Twitter. He did it to the get feedback on potential artists to invite in Indonesia. It seems that the public preferred 311 more than Jane’s Addiction. Negotiations done, 311 scheduled to be in Jakarta March 30, 2010. # 311toindonesia is a step closer to reality. @NickHexum, @311 lead singer was amazed on how 311 fans convinced Adrie as a promoter to bring 311 to Jakarta. NixHex even suggested 311 fans in Brazil to follow the steps taken by the Indonesian fans. It is interesting to observe NickHexum’s and @Pnut’s foot prints in Twitter. They actively interact with the public through Twitter. I was quite amazed when @Pnut replied to my question in Twitter about 311 the price of their t-shirt. In addition to 311 official account in Twitter, Nick and Pnut represent the band in twitter, while Chad, S.A, and Tim did not. Only Pnut aka Aaron Wills who has a Facebook account as 311 representative, any other accounts on other 311 members are false. 311 fans are in exultation. Then I found out more about the 311. Then I knew other 311 enthusiast. I just found out that @gadisbekasi, an old friend, a lead singer for the band Souljah, who is also a friend in learning poetry; has maintained contact with the Raspler brothers as 311 management teams since a few years ago. I got to know @limasenar who found out the ‘311’ number in his tax ID and often get a bill with the number ‘311’ in it. I got to know @mcgr7 whose hobby was counting down to the day and also the one who enjoyed watching 311 guys from afar instead without hysteria. I got to know @bun9jams who co-organized 311 Day in Indonesia. I got to know @adiaprabowo, a 311 that flew few miles from Surakarta. 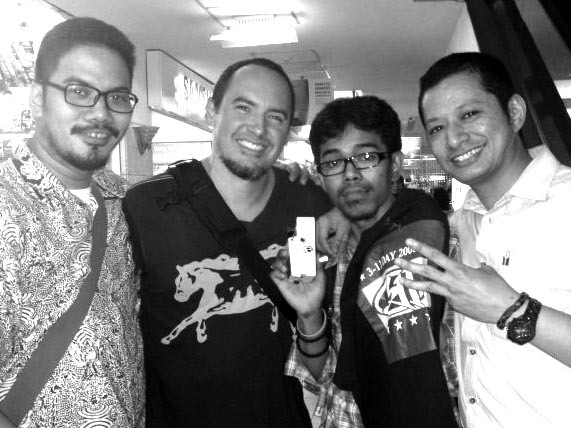 I got to know @reza_tarigan lucky enough to be a liaison officer for 311 during their visit in Jakarta. I got to know about @guslifter311, who flew from America to Indonesia specially to see 311 in action in Jakarta (haven’t met him in person, but we will do soon, right bro?). Nice to meet you, guys! One day before the 311 gig, I get the information from @ reza_tarigan and @gadisbekasi that there some 311 members were at the moment went shopping Mal Ambassador. Me, @bun9jams and @limasenar rushed to the location. We swirled in the mall, as if without purpose. In an iPod accessories store, we saw some foreigners, big and tall. And in front of the cashier, we saw the face we knew, it’s S.A. Martinez. It is an opportunity too valuable to waste, so we asked permission for autograph and photo sessions. We certainly will do that, because we are Indonesians and we always did that. Don’t Stay Home This Time ! The big 311 day has arrived. We were in euphoria. All 311 fans have gathered together, in between Amber song fans, Love Song fans, as well as other colleagues who happened to get a free ticket to watch the show. And the hip-hop funk rock reggae party night was started with a Beautiful Disaster. NixHex moved in a very flamboyant style. S.A. Did the energetic dancing back to forth. Tim concentrated on the corner with his guitar. Pnut jumped around with his high tower appearance. Chad off course, was calm behind his drum set Song after song floated out loud accompanied by a giant choir of about four thousand people in Senayan. From Beautiful Disaster, Love Song, Homebrew Creatures, Come Down Original floated up. 311 even played the 311 Love Song and Amber that night, which previously never been played together in a single show. Time flies, it has been two dozen songs over and night has to end. 311 must continue his journey to Japan. Many of 311 fans that night still did not believe that those five Omaha cowboys have played in front of their eyes in Jakarta. It was just like unwilling to wake up from a happy dream. I personally feel very happy though some favourable songs was not played. But it should be hard to choose 20 songs from about 140-strong kickin’ songs 311 has throughout their career. 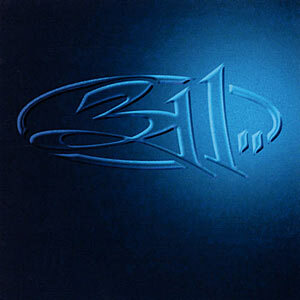 i listened to 311 while i was still in junior high school & saw their concert in jakarta. love it! it became one of my favorite concert (besides bjork & mew), hehehe..
yaa … seru bukan. meskipun sound tennis indoor gak bagus, seperti biasanya. Bos, tolong bujukin promotor2 di Jkt supaya datengin 311 ke Indo lagi dong..he he..
311 Rocks !!! Hell Yeaah !! !